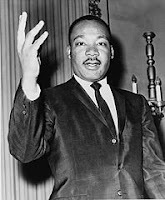 lauri♥brooke: martin luther king, jr. In looking him up on Wikipedia, I found that I know very little about this man. Unfortunately, until this point, I admit, I never thought much about this day where we celebrate him. I was wrong. Our daughter Robyn is bi-racial. She prefers the descriptor brown to black. She is the only brown girl in her class and she felt embarrassed when they talked about him in school. She said she pulled her jacket up over her face. That prompted many questions about Martin Luther King, Jr., and who she is as a brown person. And I don’t know the answers. We are going to Barnes and Noble to look at books and learn more about him. Although I feel that I have failed in this area in the past, I do believe this is a really great opportunity to spend time learning and growing together. Martin Luther King, Jr. was not just a great civil rights activist, but an important piece of our nation’s history. I am excited about this chance for Robyn and I to spend time together and to learn.